Most communities that have implemented plastic bag bans have generally followed the same prescription. First, plastic carryout bag are banned at checkout, and a minimum fee of 10-cents is charged for each paper bag issued in order to coerce shoppers into bringing their own reusable bags. In addition, most communities but not all, provide an exemption to the paper bag fee for certain low income groups. Most communities that have passed plastic bag bans have done so without seriously considering the impact upon on community residents. In particular the costs imposed on residents complying with the bag ban. While a few cities have calculated the cost of reusable bags for a typical family, they have largely ignored the value of personal time required for residents to handle reusable bags (such as the effort to put bags into the car, wash bags on a regular basis, dry bags, fold bags, etc.) and the increased cost of water and energy. As a result such estimates are flawed and incomplete. In an article titled “Plastic Bag Alternatives Much More Costly To Consumers” the cost of different bag alternatives is estimated and discussed. This analysis includes bag alternatives such as store supplied plastic bags, store supplied paper bags. Shopper supplied plastic bags, and shopper supplied reusable bags. Furthermore, the analysis includes not only the out-of-pocket costs for bags and also the value of one’s time calculated at $12 per hour required to manage shopper supplied bag options. Bag usage statistics before and after a plastic bag ban for the City of Santa Monica were assumed for each city in the state of California. These statistics were collected by a student group from Santa Monica High School called Team Marine and included observations of more than 50,000 shoppers over a two year period. While bag usage statistics for each city are not available and even though each city’s demographics are different, we can nevertheless estimate resident cost in other California cities using the bag usage statistics from the City of Santa Monica. Most but not all communities an exemption is granted to families that participate in the California Special Supplemental Food Program for Women, Infants, and Children (WIC) or in the Supplemental Nutrition Assistance Program (SNAP) also known as the Food Stamp program. Participants in these programs are allowed to receive free paper bags when they shop; whereas, all others must purchase paper bags or purchase and use reusable bags. In addition, participants may be eligible for free reusable bags at the option of the store. While approximately 14.96% of California’s population is eligible for these benefits, it is unknown how many will participate by receiving free paper bags or will use reusable bags. 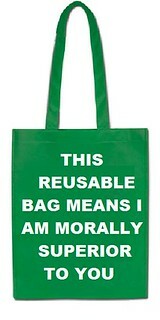 We make the assumption, that shoppers eligible for free paper bags will choose this option rather than use reusable bags. No community in the state of California has seriously calculated the cost of implementing a bag ban upon residents. While a few cities have calculated the cost of reusable bags for a typical family, they have failed to take account the personal time involved in handling and washing reusable bags and the associated cost of water and energy. The truth is most elected officials simply do not care what a plastic bag ban will cost their residents. The methodology and the assumptions used in the spreadsheet and in the summary report listed below are best described in an article titled “What will a Plastic Bag Ban Cost Your Community”.